Google Ads account daily for opportunities and issues. Based on a list of best practice standards our rule engine finds duplicate keywords in the same geographical targeting criteria, campaigns that have hit budget and sub-optimal settings such as low sitelink count among others. These mistakes can lead to overspending or missing out on traffic and conversion opportunities. Squared.io analyzes your settings for anomalies and gives you the opportunity to fix them from the interface so you can maximize the traffic and conversions for your account. 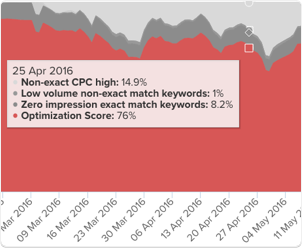 This is the proportion of your account spend on exact match keywords. You buy keywords, but your customers type in search queries. If you can match what a user types with well targeted ad copy you can increase your CTR and therefore increase your Quality Score. If you manage that you have the opportunity to keep your CPC as it is and get more traffic or reduce your CPC and save money. It's a win win situation! 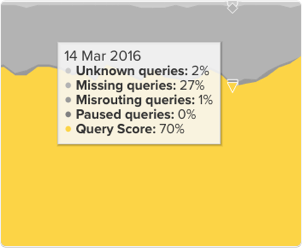 These are search queries that have been clicked but do not exist in your account on exact match. We recommend you add as many search queries as possible to your account. Sometimes a broad or phrase match keyword matches a search query which you already have on exact match for the same targeting options. This is where Google has not provided a search query for your spend. We have found from experience that as you add search queries this number reduces. The most conclusive way to save money and get more traffic is to increase your Quality Score. Squared.io analyzes your spend-weighted Quality Score for every keyword in your account and shows you opportunities where you could maximize the traffic from a keyword at low cost or find irrelevant keywords which are dragging down the Quality Score of the account. 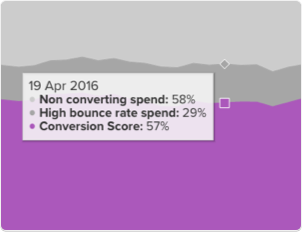 As you can see from the screenshot, your value score is calculated as the percentage of your spend on keywords with a Quality Score greater than six - which is accepted as a good score. 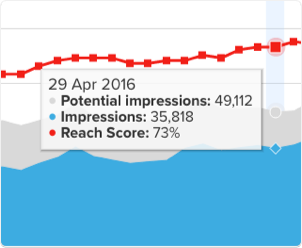 Impression share is one of the most under-rated metrics of a Google Ads account. Reach score is your achieved impressions as a percentage of your potential impressions accoring to your impression share. Low impression share can happen when budgets are set too low or if Quality Score is problem preventing the account from growing traffic. Squared.io helps you find opportunites for traffic growth as well as budget and Quality Score issues preventing your account from achieving its potential. This score takes account of the activity of users after they have clicked through on a Google Ads ad. Nobody wants to buy clicks to a page with a high bounce rate or buy keywords which generate no sales. Conversion score finds keywords where these metrics are negatively affecting your account and allows you to remedy the issues by adding negative keywords or changing your landing page.